Week 3 of my Eating Around the World challenge took us to Andorra. After a little research, I realised Andorran cuisine shares a lot of similarities with its Spanish neighbour, Catalonia. So knowing that, I had to make this Crema Catalana. 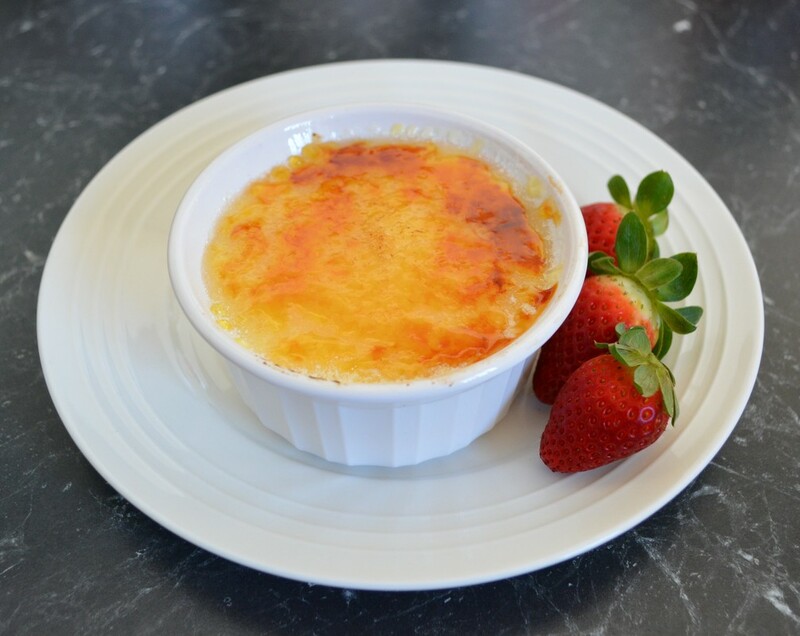 This is the Spanish version of the Creme Brulee. The custard is perfectly creamy, hinted with a subtle aroma of lemon and cinnamon. The hard caramelised sugar coating, gives a little bitterness to the dish. Simple, elegant, beautiful, these are the three words I would use to describe this dessert. I thought with 8 egg yolks it would be 'eggy' but it really isn't, it really is a beautiful custard. Leftover egg whites can be frozen, make a Pavlova with them or Almond Bread. When you add the hot milk into the whisked eggs make sure you are adding it slowly and whisking the whole time, you don't want scrambled eggs. I don't personally strain the mixture into a jug, I just remove the cinnamon stick and that's it, I'm ok with the lemon rind in the custard, especially as I microplane it so it is superfine. When you are heating the custard, as soon as the mixture thickens and you feel resistance while stirring, remove the pot from the heat or the mixture may curdle or separate! The texture of the finished crema will be grainy instead of smooth and creamy as it should be. It thickens further whilst cooling. If you don't have a blowtorch, I suggest you buy one, they are great for this recipe, but you can place the cremas under a hot grill instead, top shelf and caramelise the sugar that way. Just watch it doesn't burn. Trying to impress someone, or looking for a simple dinner party dessert, try this, it's simple, elegant and beautiful. Beat egg yolks and sugar in a large bowl with electric beaters (or a balloon whisk) until creamy. Place 1 litre (4 cups) of the milk, rind and cinnamon in a large saucepan; stir over medium heat until the mixture just comes to the boil. Remove immediately from heat. Strain milk mixture into a large heatproof jug; pour milk into egg mixture, whisking constantly. Stir remaining milk and cornflour in a small jug until smooth; add to egg mixture. Return mixture back into your saucepan, stir constantly over low heat until the mixture boils and thickens. Pour mixture into a 26cm heatproof pie dish (or individual ramekins). Allow to cool slightly, then cover, refrigerate 4 hours or overnight. Sprinkle custard with extra sugar. Using a blowtorch, carefully heat the sugar until it is caramelised. ​Serve immediately, with fresh berries.